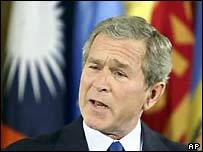 Bush: "War on terror is our fight"
US President George W Bush has said there can be "no neutral ground in the fight between civilisation and terror". Speaking on the first anniversary of the US-led invasion of Iraq, he described the war on terror as "an inescapable calling of our generation". This month's attacks in the Spanish capital, Madrid, were a reminder the civilised world was at war, he said. The US was sending an "unmistakable message to the terrorists" that they would face their day of justice. There is a dividing line in our world, not between nations, and not between religions or cultures, but a dividing line separating two visions of justice and the value of life. Mr Bush was addressing diplomats and other figures in the East Room of the White House, but the BBC's Rob Watson says that his message was aimed at the peoples of the countries they represent. All in all, our correspondent says, this was a rather humble-sounding President Bush, with the tone of a man anxious to repair relations with friends and allies abroad. Mr Bush sought to present a united front in the war on terror. Differences with our allies over the Iraq war "belong to the past," the president said. "Any sign of weakness or retreat simply validates terrorist violence and invites more violence for all nations," Mr Bush told his audience. "We will face this mortal danger and we will overcome it together." He was speaking at the end of a week in which US policy on Iraq has faced new challenges, with the new Spanish government raising serious doubts about its military commitment in Iraq. The new Spanish Prime Minister Jose Luis Rodriguez Zapatero on Monday described the situation in Iraq as a "disaster". Demonstrations against the US-led military presence in Iraq are to be held in a number of US and European cities on Saturday, with large crowds expected in Spain, Britain and Italy. The US administrator in Iraq warned on Friday that he was braced for "some really bad days" in the run-up to a transfer of power to a transitional Iraqi authority, planned for 30 June. "The terrorists are going to continue and even accelerate their attacks," said Paul Bremer. Mr Bush thanked each ally in turn for their military efforts in Baghdad, noting the British, Polish, Japanese, South Korean, El Salvadorian, Macedonian, Kazakh and Turkish contributions. "All of these nations, and many others, are meeting their responsibilities to the people of Iraq," said the president. He pointed to the removal of the Taleban regime in Afghanistan as evidence of the success of the war on terror, saying that both boys and girls were now back at school in the country. "The establishment of a free Iraq is our fight. The success of a free Afghanistan is our fight. 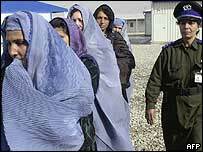 The war on terror is our fight," said President Bush. "A president trying to reclaim that lost spirit of unity"
"The war on terror is not a figure of speech it is an inescapable calling for our generation"